Hyosung TNC is tapping into the global denim market with its Creora brand, the No. 1 spandex fabric in the world. Hyosung TNC was the only Korean company to set up a booth at the Bluezone show held on September 4 and 5, 2018 (local time) in Munich, Germany. At its private booth, Hyosung TNC introduced its creora® eco-soft and other functional denim fabrics. 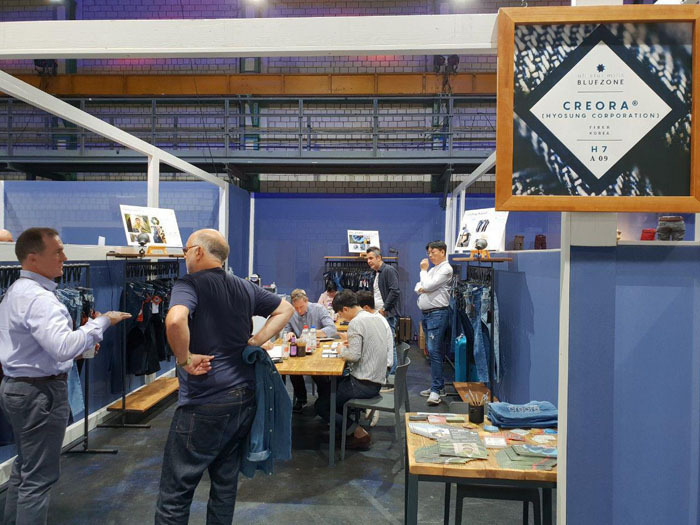 The Bluezone denim show is part of the Munich Fabric Start participated in by more than 1,000 fabric manufacturers from around the world since 1995. It is an international fair for European and other global denim makers to share the latest trends and set new ones. At this year's fair, Hyosung TNC introduced its Creora brand, a fabric optimized for denim wear, with the aim of attracting new customers and reaffirming its position as a premium brand. The company's goal is to expand its global denim market by developing new fabrics customized to the latest trends with some of its major global customers. At the fair, Hyosung TNC introduced the creora® Fit2 designed to stretch vertically and horizontally, the nylon MIPAN® aqua-X that is cool to the touch, and the polyester “askin” with cooling effects. "Creora is already the No. 1 spandex brand in the world, and I expect it to be a leading player in other areas such as new textiles and clothes where denim and spandex are used. We plan to improve the quality and strengthen our marketing capabilities so that Creora can satisfy our customers in every aspect, including trend, style, environment-friendliness, and design," Chairman Cho Hyunjoon said. Hyosung TNC also showcased its heavy-duty nylon MIPAN® robic as well as creora® Power Fit, which is most commonly used in the premium denim market for its excellent heat and chlorine resistance.